In-app billing is a bit of a touchy subject. Nobody begrudges developers that try to make a few dollars, but billing for extra content as a per-app basis just isn't very popular among users. Some don't like the fact that purchases are tied to a particular phone, and we can certainly understand that. Wiping your phone or buying a new one and losing all your game content is no fun. For others, the only acceptable way to monetize applications is to charge a flat fee up front. 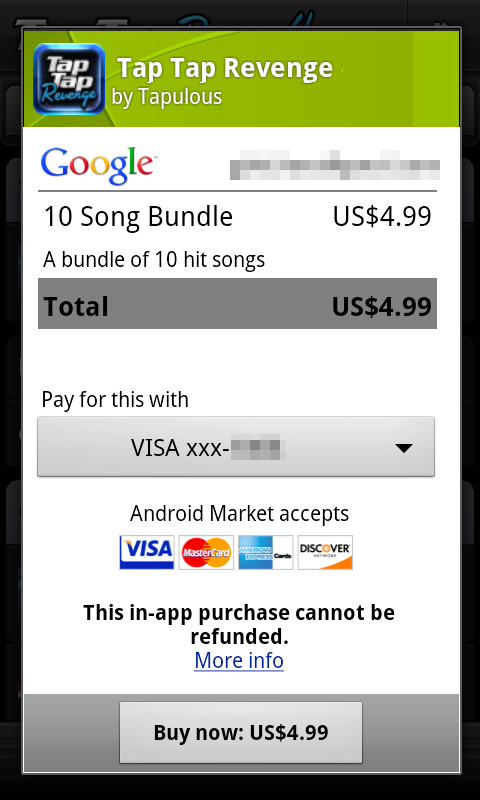 We won't even comment on paid applications that offer in-app purchases as well, but they're out there. On the good side, it's a way to offer a basic application for free, which everyone likes to see. On the bad side, it can get expensive in addition to the above. Tonight we're asking you guys. Vote in the poll and let us know! Do you make in-app purchases?